If you’ve seen the 2018 Wonder Woman movie, you know the scene. Wielding a shield, she holds back the flame of Ares the god of war. If only we had a shield like that. And the power to stand under that type of attack. We could get through our tough days, our traumatic days, our heart-shattering days when we feel alone in a kind of darkness where no one hears our screams for help. For months, I relied on this verse. 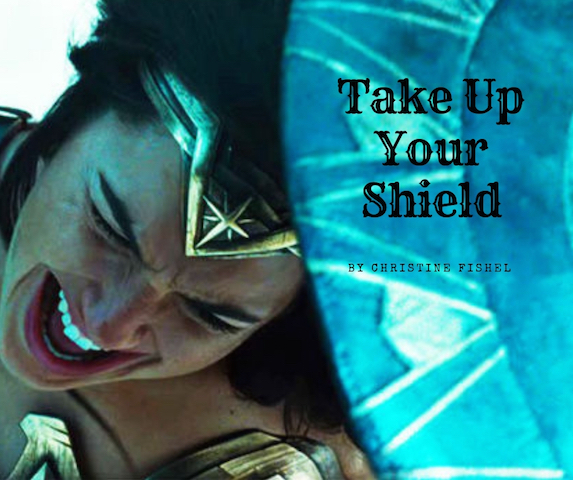 When attack and the illness and death of others were near, I focused on my cheek resting in His lap, His hand occasionally reaching down to smooth my hair, all while He held the shield above me, protecting me from the harm inflicted in this world. 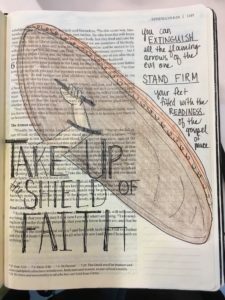 And then, not long ago God showed me this: “Take up the shield of faith, with which you can extinguish all the flaming arrows of the evil one.” (Ephesians 6:16) Take up the shield. 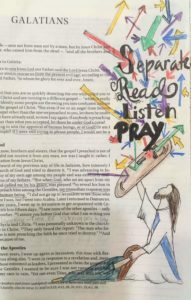 It felt like a clear and specific message to me, and I felt the energy of the Holy Spirit propelling me toward this calling. I thought I needed to stand firm, hold the shield, take the attacks and still stand firm. That’s what I thought. But I found myself in a pit, exhausted, defeated, depressed. I see this now: I cannot hold the shield with my own strength. 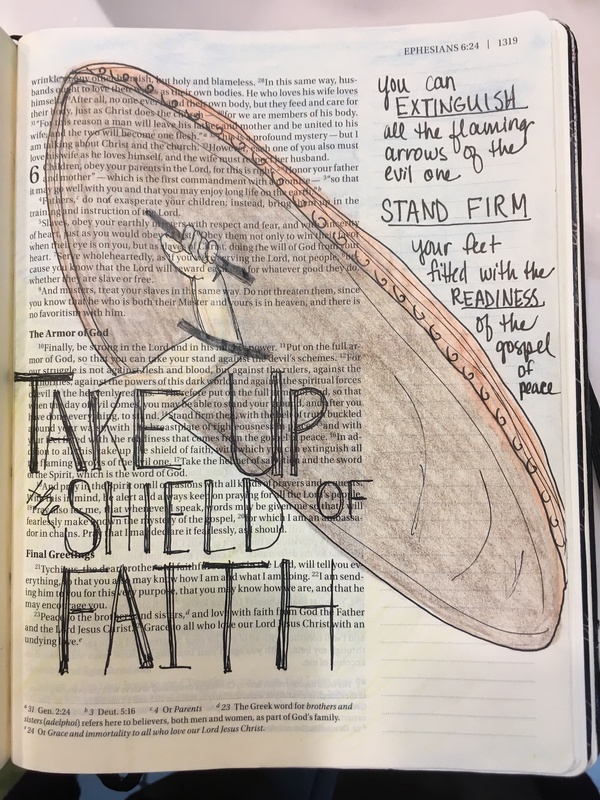 It is the shield of faith. And while I have faith–I am confident of that–what I do not have is the rest of the armor. I know my own weaknesses well, and I know I am missing the sword. “Take the sword of the spirit, which is the word of God.” (Ephesians 6:17) No wonder I was feeling so weak, exhausted from the heaviness of the shield and beaten down by the battering of arrows. I was not filling myself with His truth, discerned from His word. Our days are filled with so many responsibilities, so many people needing us—to wake them, feed them, teach them, guide them, protect them, and comfort them—so many tasks, work responsibilities, volunteer jobs, marriage commitments, friends to connect with, futures to prepare for. If we do not provide ourselves with even the smallest bit of time to soak in what our own Father has to teach us, how will we be able to continue providing for others? The older I get, the more I see that life is hard. It is so very hard. But our Father knew that way before we were even born, and He has given us tools to be able to stand. We have the shield. And with it, we have the sword. We need only to give ourselves the time to cultivate them. I love your illustrations. Especially the first one. I took a picture of it so I can refer to it when I feel that way. Thank you. 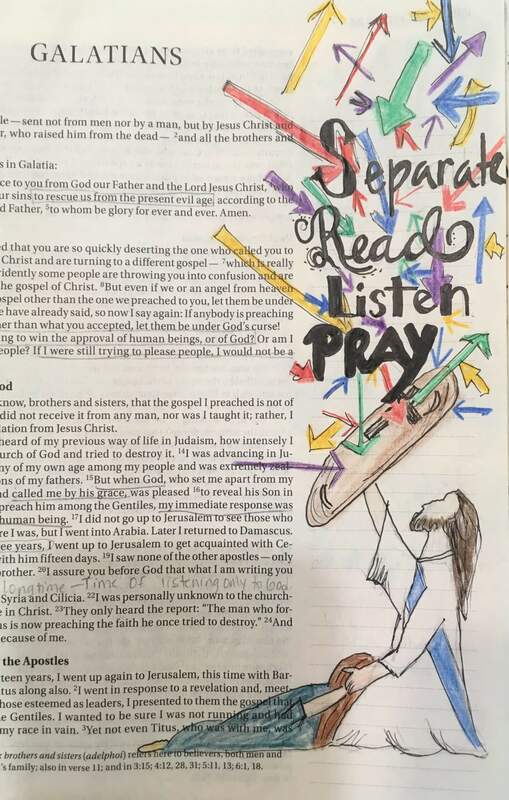 Thank you for writing this blog and reminding us to spend time with the Lord. He was the guidance, knowledge, and grace to see us through all the battles and challenges we face.